Read Post of 11 March 2012 and 6 April 2012 for background to this 4-part series. Bound by sphere of Light. Outflows the sea of Life. 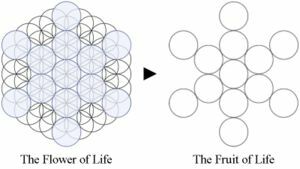 Visualise the Fruit of Life symbol (shown above, on right) seated on your third eye chakra as you contemplate the meaning of this tablet. Additionally, you may listen to the Hall of Life energy transmission gifted by Thoth on the full moon of March, for revitalising the heart and hence, your entire body. Many Blessings, Ann. Click HERE for information on 20th May 2012 Master Teaching Class (Singapore) – Remembering Keys to Ascension hosted by Thoth. Seats limited to 50. Please register early. May you be endowed with the golden blessings from Lord Gautama Buddha and the spiritual hierarchy on this Vesak Full Moon! Peace and Oneness, Ann.